Medici Masters of Florence is the new television series produced by the Italian Television RAI which tells the story of the Florence Medici family and the Tuscan Renaissance. The series was created by Frack Spotnitz, the man behind the X-Files, and is directed by Sergio Mimica-Gezzari, writer of several episodes of Battlestar Galactica and Prison Break. Medici Masters of Florence stars several internationally renowned actors such as Oscar winner Dustin Hoffman as the patriarch of the Medici family, Giovanni de’ Medici, and Richard Madden, best known for portraying Robb Stark in Game of Thrones, as his son Cosimo. The series was shot last year on location in Florence, Montepulciano, Siena, Rome, and Tivoli. 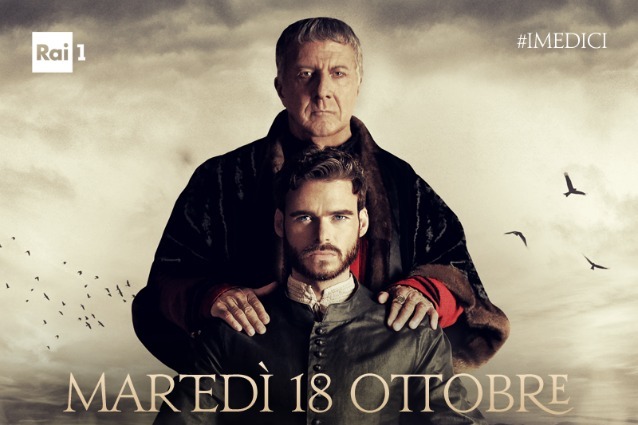 After the first 2 episodes aired on Italian Television RAI on October 18th, social media exploded with positive reactions and the inevitable critical remarks about the historic accuracy of the show. The show however doesn’t claim to be a historic document about Florence’s most famous family, who ruled the city for several centuries, but a fictitious representation. Taken as such, the series does not disappoint with the beautiful scenery, costumes and set decors. It is yet unknown when the Medici Masters of Florence series can be seen in other countries, including the UK and USA. The Medici family suffers a great loss with the death of its patriarch Giovanni. When the designated heir Cosimo discovers that his father was poisoned, he decides to keep the news to himself and to put Marco Bello, his right-hand man, on the assassin’s trail. Cosimo, who has long abandoned his dream of becoming an artist, then takes his father’s place as head of the bank and of the Signoria, where he needs to defend himself against the hostility of the noble families, led by Rinaldo Degli Albizzi. When the Duke of Milan annexes the city of Lucca away from Florentine dominion, Cosimo must decide whether to side with the nobility, as Giovanni would have done or to free himself from his father’s shadow. The war is throwing Florence into chaos. Piero, Cosimo’s only son, is eager to fight, but his wife Lucrezia tries to restrain him. Meanwhile, Marco Bello continues his investigation into Giovanni’s murder and tracks down a pharmacist who may know something. While Cosimo’s brother Lorenzo goes (in vain) to the Pope to ask for his intervention as peacemaker, Cosimo hires the artist Brunelleschi to at last provide a dome for the cathedral of Santa Maria del Fiore. Only Contessina, Cosimo’s wife, fully understands the value of that gesture and supports her husband. Just when Marco is at the point of obtaining the information he sought from the pharmacist, he finds the man stabbed to death. Cosimo manages to buy in secret the withdrawal of Milan’s troops, thus saving the city but in the meantime, Florence has again fallen into the grip of the plague. The Medici take refuge in the country to avoid contagion, but Marco stays in Florence to investigate the Corona, a family that seems to have something to do with Giovanni’s murder. Shortly after breaking into their palazzo and finding the couple both dead of the plague, Marco hears that some men are dismantling the dome piece by piece. Albizzi has managed to foment the citizenry against Cosimo and his project, accusing him of the crime of usury. When Cosimo learns of the situation, he decides to return to Florence, even though his mother Piccarda has come down with the plague. Cosimo succeeds in saving the dome, which is still under construction, by turning the cathedral into an emergency hospital. However, in the meantime, in addition to Piccarda, the baby Lucrezia was carrying also dies. Albizzi then invents a ploy to get Cosimo arrested and held for trial. Albizzi accuses Cosimo before the Signoria of wanting to be the city’s dictator, and the trial begins. In Palazzo Medici, they are discussing what can be done, and Lorenzo thinks of resorting to force. From prison, Cosimo asks Contessina to try bribing a member of the Signoria, to buy votes in his favor. Meanwhile, Piero seeks proof to exonerate his father from the accusation of usury. However, the situation worsens when Albizzi starts poisoning Cosimo’s food through his prison guard. Next, Lorenzo appears with an army outside the walls of the city. He and condottiero Sforza are prepared to set Florence on fire if Cosimo is not released! Cosimo finds out what is happening and is willing to risk his life so that his family does not lose Florence, but Contessina goes against his wishes and negotiates exile rather than the death penalty, in exchange for the withdrawal of the troops. While the Medici are in exile in Venice, the situation deteriorates day by day in Florence, with Albizzi imposing his rule over a city gravely depleted by the absence of the Medici. Contessina remains alone in the city, where she is at risk, but Cosimo is too busy to defend himself from Venetian plots or to find a way to safeguard his wife’s fate. Meanwhile, Contessina encounters Ezio Contarini, a childhood sweetheart she has never forgotten. Distance also leads Cosimo into temptation when he is attracted by a slave girl, Maddalena. 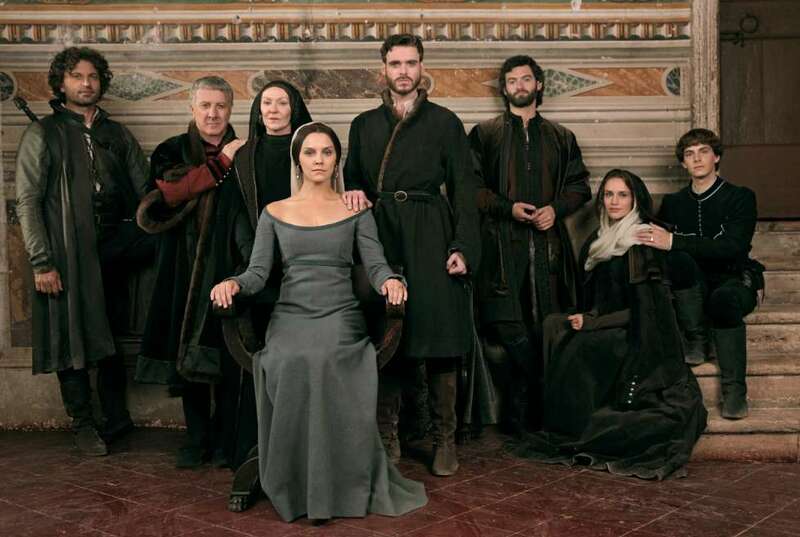 When Cosimo finds he must evaluate the chance to regain Florence by force, with the help of Milan, it will prove to be information provided by Contessina and Marco Bello that enable him to make the winning decision. Pazzi has managed to convince the Pope to remove the Medici as Church bankers, but Cosimo is disinclined to surrender what he has worked so hard to attain. Meanwhile, Maddalena finds that she is pregnant; and when Contessina too finds it out, she is faced with the decision of what to do about the slave and her baby. Cosimo asks Lorenzo’s forgiveness and persuades him to stay and help him to incriminate Pazzi. While Cosimo goes to Rome in an effort to retake the city and the Papacy for Pope Eugene, Piero has to give a speech in the Signoria on his father’s behalf, to bring Cosimo’s strategy to completion. Lorenzo’s investigations lead him to discover evidence against Pazzi, but the consequences will prove tragic. In the end, Cosimo will once again find himself at a crossroads: what he chooses could safeguard the family’s future, but it might also condemn his soul for eternity.